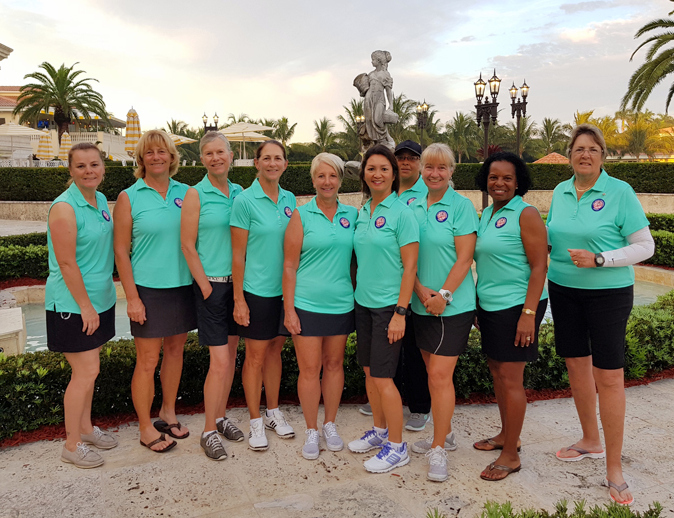 Two Rounds Down of competition at Trump National Doral in Miami, Bermuda’s Kitty Michael Women’s Golf team is leading the field in the Low Gross Division. The Bermuda team are 8 strokes ahead of Southwest Florida with a score of 518. Bermuda is also placed second in the Low Net Division with a score of 444, only two strokes behind the leader, Panama Team. Kathy Lloyd-Hines achieved lowest Gross score in both Rounds, shooting 86 at the Blue Monster Course in the First Round and 80 at the Golden Palm course during her Second Round. The final Round is on Thursday, and the ladies are ready to battle it out at the Red Tiger course. The way the scores are calculated are to take the 3 best gross scores and the 3 best net scores of the day’s competition.